Week has changed, but there's still more WoW Cataclysm Heroics to tackle. It's time to venture into Deepholm and into The Stonecore, to find out what kind of treasures awaits us there. So far Blackrock Caverns has been the most profitable Heroic to clear. Stonecore however is infamous for the amount of trash packs in there. Will Stonecore be even better than BRC? 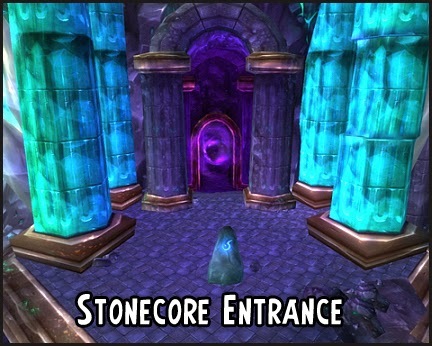 How much wow gold can you make by soloing Heroic Stonecore? Usually people farm Stonecore because an unique mount drops from the second boss there. We're not here for the mount though, but it can be a nice little extra if you're lucky enough to see it drop. It drops in both Normal and Heroic mode, and has a similar drop rate. I've discussed solo farming Reins of the Vitreous Stone Drake in Stonecore before, so I won't discuss it more in this post. If you missed the post and want to read more about the mount, you can read the post here. Getting to Stonecore is easy. If you have unlocked Deepholm, you can take the portal from your capital city. Then just exit the building and turn right. Hug the wall and move slightly up. You can then see a platform with a meeting stone on it. 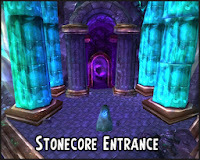 There's the entrance to Stonecore. If you haven't visited Deepholm before, you can talk to the NPC next to the portals in your capital city. There's only one achievement to get here. Rotten to the Core: Pull the last 3 trash packs at the same time and AOE. All dungeons give more gold per hour when done in normal mode, but for a single run it's usually best to do it in heroic mode instead. Stonecore does not drop level 77 greenies either, so you're not losing much. There's a ton of mobs in this instance, even so many that you may get the urge to pull a whole room at a time. If you want a decent amount of extra gold, you can run straight to where the first boss spawns. There's a big group of adds that are gonna get killed by the boss, unless you kill them first. The mobs prior to first boss are easy to kill, so it does not matter if 20 mobs are following you. Just run past the mobs if you are faster than them. However, after the second boss is dead and you get to the room with a hundred mobs, it may not be a good idea to pull them all. If you want to pull more than 3 groups at a time, it's recommended that you backtrack a bit after pulling, and line-of-sight them, so that the casters have to enter in melee range so it's easier for you to aoe nuke them down. "Very fast to clear and the amount of trash is nothing but amazing!"